I am excited to announce the next fun and exciting event from Andersons Angels, This Mamas Life, The More The Merrier & Woven by Words! 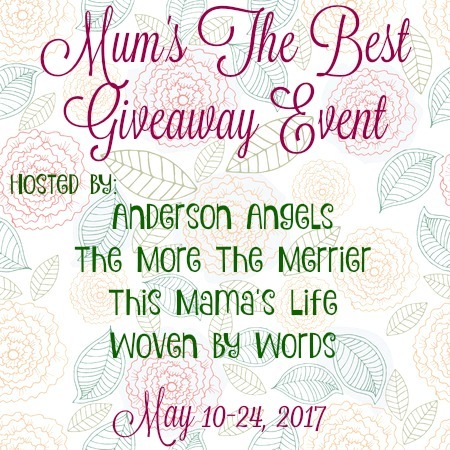 We are excited to bring you a Fun May Event called Mum's The Best Giveaway Event. It will run from Wednesday May 10, 2017 at 12:00pm EST through Wednesday May 24, 2017 at 11:59pm EST. It's super easy to join in on the fun! DEADLINE: Sign-ups close on May 5, 2017. Details will be emailed by May 8th. If you have any questions about the event, we're available to help! I would love to throw Giveaway party to my mom at event venues Chicago. It’s her dream to do party there. Going to invite all her friends and my family too. Hired professional bakers and caterings services. Gonna hire best florist for décor work.